Miniature Iron Throne from Game of Thrones! Based on the same sculpt as the larger replica. All the same detail in a smaller, more affordable format! A fantastic miniature version of the Iron Throne replica! 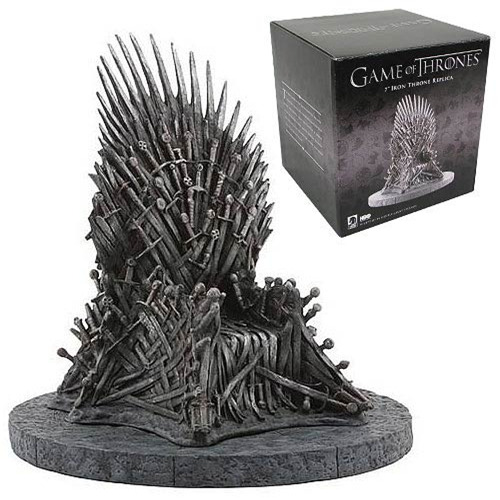 Based on the same sculpt as the larger Game of Thrones Throne Replica Statue (sold separately), this marvelously crafted Game of Thrones Miniature Iron Throne 7-Inch Replica Statue captures nearly all the same detail in a smaller, more affordable 7-inch tall format. The base measures 6 1/2-inches in diameter.